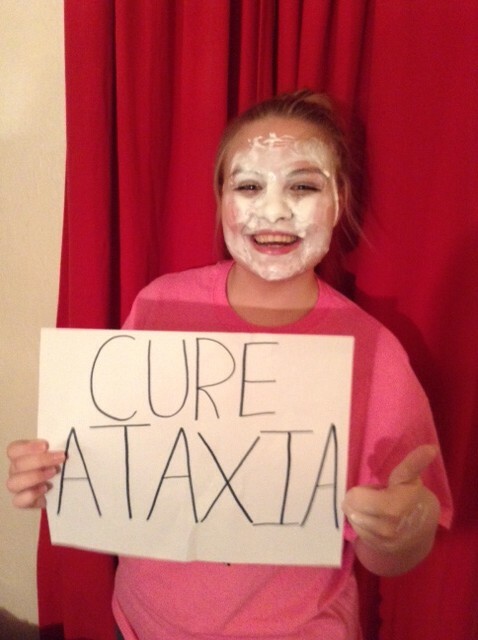 I took the Pie Face Challenge on March 26th to show my support for Ataxia. One challenge can make a difference! We’ve all heard about the Ice Bucket Challenge for ALS (Amyotrophic Lateral Sclerosis). This challenge raised over $100 million and increased awareness for the disease that affects approximately 5,600 people each year, according to the ALS Association. Videos of people dumping a bucket of ice cold water spread rapidly on social media such as Instagram, Facebook, Twitter, and YouTube within hours. Although ALS is very rare for some people, it is now very commonly known, especially because of this challenge. Now, there is another disease that people are trying to raise awareness about. This disease is known as Ataxia, and is similar to ALS in some ways. Due to lack of research and knowledge pertaining to Ataxia, there is a fun challenge that can raise money and awareness: the Pie Face Challenge! However, we must all remember that these are not just fun challenges to do with your friends or family. This challenge is crucial to help raise awareness, and money specifically for the National Ataxia Foundation to do research and tests. It’s fun, and easy for a great cause that deserves to be known just as much as ALS or even Cancer. The Pie Face Challenge has only raised a few hundred dollars last year because it is so rare. Other diseases have raised millions of dollars and have been put in the spotlight, and now it’s time for Ataxia to be put in the spotlight because many lives have been lost, and many people have suffered with this disease. 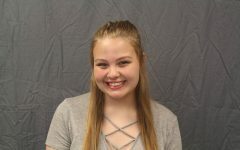 With the help of Grand Center Arts Academy students, teachers and staff, we could raise thousands of dollars and truly make a difference for the Ataxia community. The pie face challenge is definitely impactful because it raises money for research, it informs people who are unfamiliar with the disease, and it encourages people to donate to charity in general. Being the daughter of a mother who is suffering from Ataxia, there are many fears. My mom has had Spinocerebellar Ataxia, which deteriorates the cerebellum (the base of the brain), for six years now and is still fighting strong. There is no cure at all. There are 50-100 different types of Ataxia, but they all damage the neurological system. It also has the power to impair a person’s legs, arms, hands, speech, heart, eye movement, ability to swallow, capability of walking, and ability to keep balance. This leads to other injuries related to dizziness, unsteadiness, and a wide gait. For some of those affected, they are already in wheelchairs or paralyzed as young as the age of eight. The outcome is very alarming and life-threatening depending on the type. Due to the fact that there is not a cure or any treatment, patients have the option to participate in therapies. There is physical, occupational, speech, and swallowing therapy, that might give them back more ability and strength. When a person is first diagnosed, they do neurological evaluations of the brain including MRIs or even various blood tests. Genetic blood tests are available also to help figure out what gene the disease can be categorized under from a certain family member. As for my mom, she goes to Washington University Movement Disorder Clinic every December to see Dr. Joel Perlmutter who is the head of the whole clinic. Each year, the disease has unfortunately progressed according to the tests she has to demonstrate in front of the doctor. These tests are not difficult, but simple everyday tasks that a person wouldn’t think twice about doing. She is asked to walk in a straight line, to look from side to side to test eye movements, and to lift up limbs to check the muscles. The list of tests goes on and on. It is truly devastating to see how hard it is for my mom to even complete simple daily tasks such as driving, or even getting dressed, knowing that there is nothing that can cure this dreadful condition. It can be difficult to help the person affected, but the Pie Face Challenge is not difficult to participate in, knowing that it could possibly raise money and awareness to cure this disease. As an example of how this challenge can help, on Tuesday March 10th, Mr. Riley took a pie to the face to help raise money for students to travel and perform in New York City. This shows how fast a community can come together for a fun and silly challenge, to help fellow students and teachers reach their well intentioned goal. We can surely participate to help benefit others who absolutely need it, especially when their life is drastically affected day by day. Maybe this time next year, there could be a light at the end of the tunnel for the many people affected by Ataxia and their families who suffer with them.